By leveraging the Proofpoint appliances we have today, which are responsible for scanning messages for spam and viruses, we are able to provide UMass Lowell users with the ability to send encrypted email whenever necessary. Proofpoint works seamlessly with our existing email Exchange servers as it encrypts email leaving the University’s private networks and heads out onto the Internet. External recipients of secure email will receive a message in their current email inbox that they have received email from UMass Lowell and will be directed to retrieve their email from a secure website. External recipients register and login to the secure email systems before being able to view or reply to secure email(s). External recipients will have the ability to reply to secure email received including file attachments. 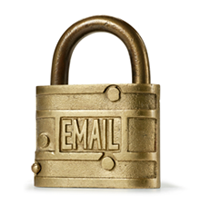 The sender (UMass Lowell employee) designates that the email should be secured by either typing the word “[secure]” at the beginning of an email’s subject line or by selecting the “Send Securely” button within Outlook when ready to send the message. The remainder of the email can be typed normally and attachments can be added as needed. The “Send Securely” button must be downloaded and installed from the IT software website. The system recognizes that the email should be secured and then sends it out as an encrypted attachment or URL. The secure email server sends the recipient an email notification that they have received a secure email from someone in the UMass Lowell community. This email directs them to click on the attachment or URL to view the encrypted message. This entry was posted in Secure Email by james_packard@uml.edu. Bookmark the permalink.